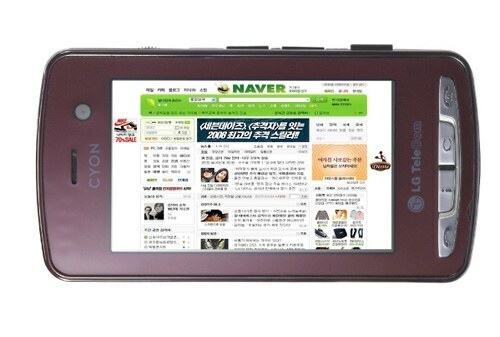 LG will offer their latest LG LH2300 Touch Web phone in Korea market. It is supposed to offer unsurpassed web browsing experience. Smells like a take at the Apple iPhone's main selling point. Although the LG LH2300 is not fit for GSM networks commonly used back here in old Europe, it's a good guess that a European version might also spawn in the near future. Packing a wide 3-inch touch-sensitive display with a resolution of 800 x 480 pixels, the LG LH2300 is targeting the Internet phone market that isn't quite crowded yet. The display is pitched as capable of displaying 26 million colors and is produced by Sharp. The LH2300 uses a unique Hello UI that arranges all your contacts info in icons that you just drag-and-drop in order to use them. For example you can drag-and-drop icons of your favorite contacts to your mobile desktop and then when you type a message, you just drag and drop it on the icon. If you want to make a call, simply drag-and-drop the contact's icon to the call button on the bottom of the screen. The LG LH2300 is further equipped with a 3 megapixel camera with auto focus, image stabilization, and face detection. There is also a DMB tuner to enjoy mobile TV on the go, Bluetooth 2.0 and a microSD card slot. Although it looks rather large on the photos, the LG LH2300 measures 104 x 54.4 x 12.8 mm, which is actually the LG Viewty dimensions, but slimmer. The LH2300 is also lighter than the Viewty with its 95g as compared to 112 g.
The LG LH2300 will be available in Grape Wine and Navy Blue colors in April 2008 and will cost around 400 euro. Too bad it's Korea-only for now - if it turns out successful, we bet a GSM variant will be just around the corner. my laptop can call over internet! does it make it a phone laptop?? ?